The SLC 500 series is probably the most famous PLC ( well as least in the US) and is often referred by its nickname "Slick". For every facility, for every kind of factory, it goes without saying that there must be a means to control the various functions and to control the very system itself. One of the most common ways that we accomplish this is by the use of a programmable logic controller. Many of the smaller programmable logic controllers tend to be less flexible and less useful when it comes to big jobs. That is not true, however of every smaller PLC. Power and Flexibility for a Complete Control Solution. This motto of the Rockwell Automation's Allen Bradley SLC 500 is the hallmark of the Rockwell Automation company as well and admirably suits the SLC500 programmable logic controller. The Rockwell Automation Corporation, also promoting and manufacturing Allen Bradley programmable logic controllers brings you the Allen Bradley SLC500 PLC, which is one of the smaller modular Programmable logic controllers that is also based on a chassis and brings you a wide array of processing choices and capabilities. Along with those many choices comes various unique power supply methods as well as a very extensive and extendible I/O capacity. The SLC500 PLC permits you to custom build a system that is precisely geared to do exactly what you need it to do in exactly the way that you need it. Designed for your application, this small sized programmable logic controller has a big field of use and a full set of features that permits it to compete on even ground with the larger programmable logic controllers. Among what are known as the small PLC or programmable logic controllers, the SLC500 is one of the smallest of the PLC's that still offers full features and advanced options which are fully capable of doing nearly all that the larger programmable logic controllers can handle. You might find the SLC 500 PLC providing the control and the functionality for a theme park, or it may be providing heating or lighting for a series of building, or this small but mighty PLC may even be operating a factory floor and offering communications as well as operations for the many different types of function that the factory needs. The small logic controller by Allen Bradley is what is known as the gold standard when it comes to small programmable logic controllers. It was brought out by Allen Bradley about 1993, and remains a full featured PLC's whether large or small and is one of the means by which others measure the success of their smaller programmable logic controllers. The SLC500 controls processes that range from large to small on a global scale, bringing function and form to everything from the pharmaceutical manufacturing facilities that make drugs for human consumption to a ride at an amusement park. 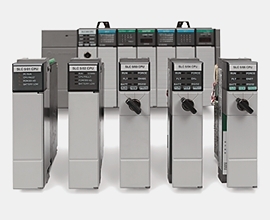 There are more than 1.6 million of these small Allen Bradley SLC500 programmable logic controllers in use worldwide. The SLC 500 is appropriate for nearly any function or use and with the ease of use and the cost effective software and hardware, the SLC500 stands as one of the most easy to understand and the most often selected of the smaller full featured Programmable logic controllers. In the United States alone, more than 100 thousand people in myriad industries have been trained on the Allen Bradley SLC 500 from Rockwell Automation systems. One of the reasons why the SLC 500 remains so often selected is that typically it is forward and backward compatible and the software in use, the RSLogix 500 programming software is based on the 32-bit Microsoft Windows operating system. This means that the most common method of computing and the easier operating system to understand can be at the root of your programmable logic controller system, making it easy to use, easy to understand, and easy to upgrade. RS Logix and the SLC500 bring you quality control, superior performance, outstanding diagnostics, and very reliable methods of communication, all wrapped up on a cost effective and energy efficient small package.